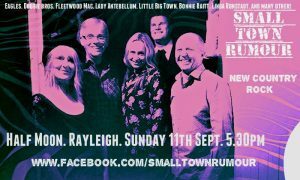 Small Town will be back at our ‘local hostelry’ The Half Moon on Rayleigh High Street on Sunday September 11th at 6pm. Playing our mix of Country Rock covers, The Mac, Eagles, Lady A, Carrie Underwood, Doobies….come and swing yer saddle bags! !